The past few days I had been tending some small projects with the jeep (license plate light, CB antenna re-mount, proper in-tank fuel pump wiring). Those projects done, there was a comment to head out Saturday. Max was interested in heading out late afternoon / evening for a night run to see how the lights worked. We planned to visit Miller Rock and Rock Creek, but as we were the only two on the trip, we could easily change plans. He heard from another that the T-33a (airplane wreckage) trail was open - but that there was a tree to deal with. I had the chain saw equipment with me so we ended up visiting T-33a. 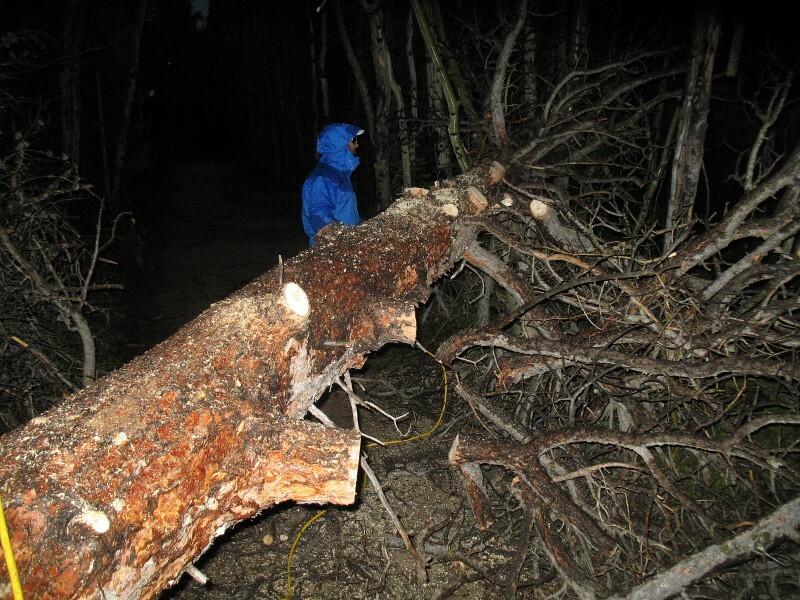 Yes, there was a large tree across the trail. It looked like one or two vehicles started a bypass around the tree, driving over good forest plants. 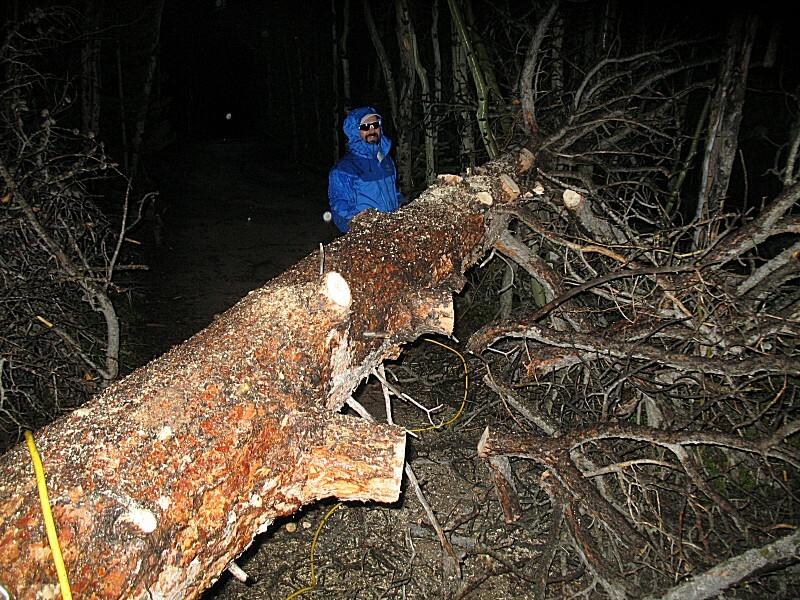 We cleared the tree and opened the trail. We drove to near the end and were stopped at a second tree. With the decently heavy rain (with nice lightning!) 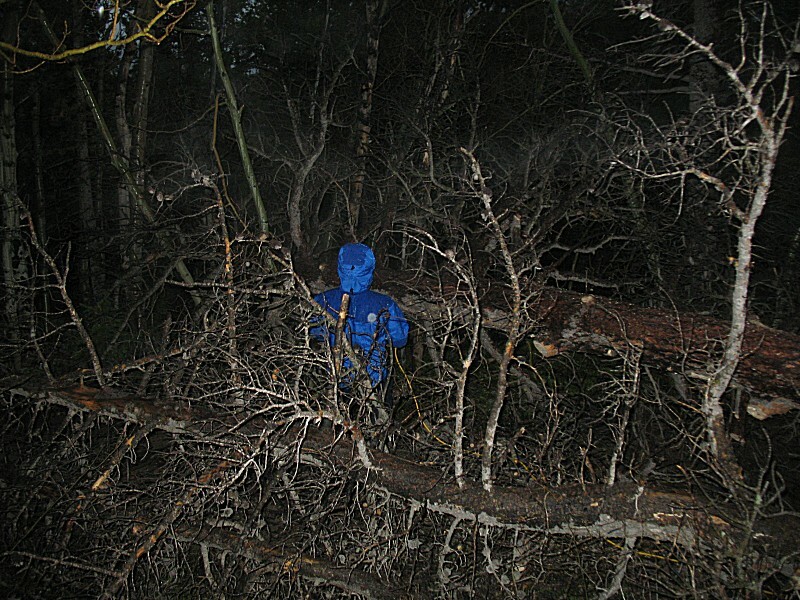 we didn't clear the second tree and turned back. The evening was quite enjoyable. There was a fair bit of "adversity". It wasn't a "typical trail" outing. The darkness changes things - it closes in the visual focus. Rain additionally closed down the visual range. Lightning was a nice tidbit. A tree to clear. Some snow. Some ravaged trails (washouts) that increased difficulty. Good times! 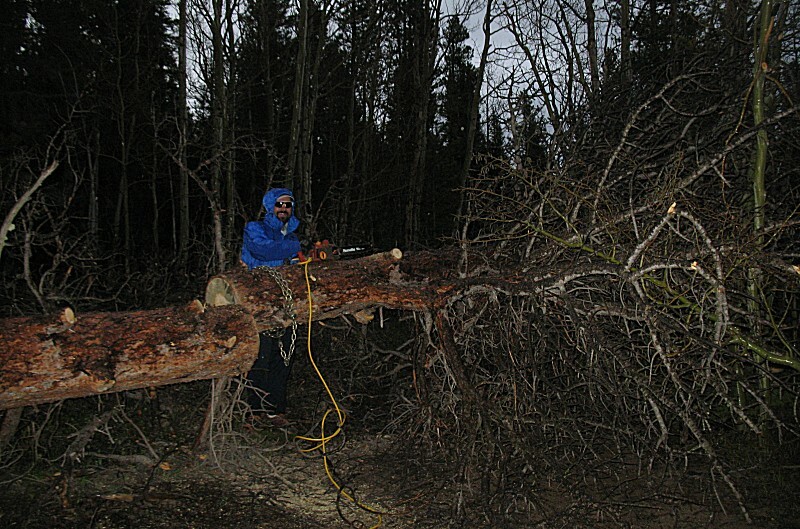 Max working at clearing the 14" tree crossing the trail. 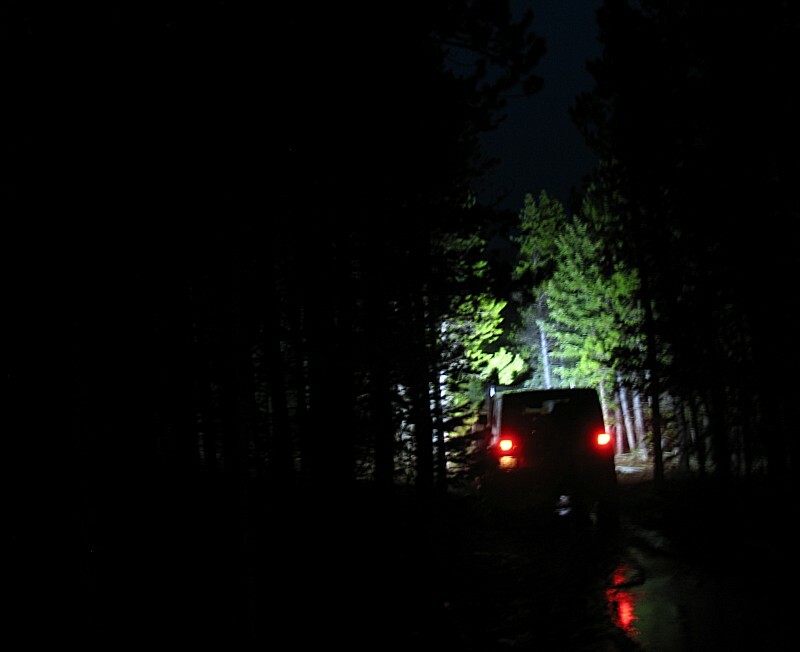 Some vehicle or two, prior to our visit, had driven around the tree and over un-tracked land. 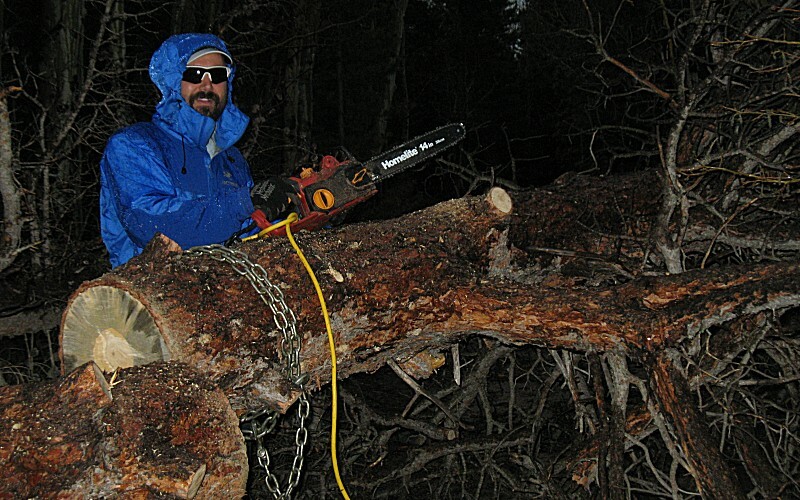 Clearing the tree would keep knuckleheads from making undesired trail. "It's 106 miles to Chicago, we got a full tank of gas, half a packet of cigarettes, it's dark and we're wearing sunglasses... HIT IT!" In the background, to the right of Max's head, is the horizontal white/silver reflective light bar (mentioned below) (not on just yet - it wasn't that dark). 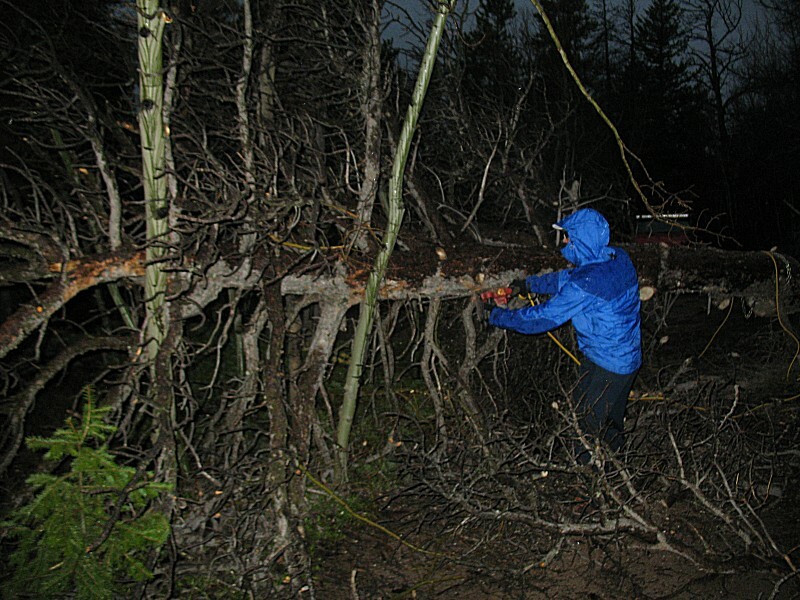 Max limbed the trunk with the limbs being tossed to where the "bypass" route was started. The trunk, once segmented, was winched to where the bypass was started. Max has a full width, two row high, LED light bar across the top of his windshield. It's crazy bright (wonderful!). The only competition to the lumens it would project were the lightning bolts tossed across the sky.